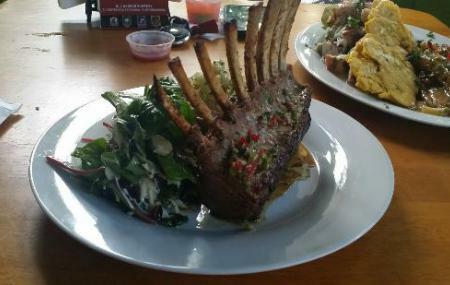 Buena Vibra is one of the most well-known restaurants in Cabo Rojo. They are especially famous because of their seafood. Apart from their signature cuisine, they also make a lot of trademark dishes, like stuffed avocado, grouper filet breaded with plantain chips, pineapple stuffed with ceviche, and shrimp breaded with coconut. The menu contains a variety of different dishes to choose from. You can choose from a range of appetizers, which includes some delicious sushi rolls. They have a number of local rice and meat dishes for the main course, but they also prepare vegetable tempura, edamame, and ‘tai’ beef, among other delicacies. The chef is very friendly, and the staff add to the delightful ambience and music of the restaurant. If you’re prepared for a feast, go for the Soy & Ginger Chicken or Lemon Garlic & Oyster Shrimp. All the dishes are made from freshly prepared, high quality ingredients. All in all, Buena Vibra is a great place to go to if you want to try out something new. One of the best restaurants in the town of Cabo Rojo. How popular is Buena Vibra? People normally club together El Bohio and Miski Mikuna while planning their visit to Buena Vibra. Great food, great selection. Original menu, atmosphere is great, great location, friendly staff. We will definitely be back! 3rd time I visited Buena Vibra: The service could be better; Its seems like don't like costumers, still waiting for my ceviche "stuffed" pineapple. The waitress seems upset and barely spoke to us. Never come back. only cash accepted for tips. when we asked they said no problem, no cash no worries. but the service was horrible. we had to wait for water for 15 min. we had kids and we had to wait 45 min for our food. food is way overpriced. asked for rice and beans never got it. the food was good but too expensive. I feel bad for waiters that cant recieve a tip because owned wont take credit card for their portion? ridiculous! Great food and great service. Love the way the employees are and the owner is a great person and is always around saluting his customers. I highly recommend this place!